In 2014 the former footballer Romário was elected senator of Rio de Janeiro, in this article I will present you with the story of this charismatic Carioca. With more official goals (772) scored than Pelé (767) he is not only one of Brazil’s all time greats, he is also one of the most loved footballers that ever played the game. Romário de Souza Faria was born in January 1966 in a Zona Norte favela called Jacarezinho, after a few years his family moved to Vila da Penha; the neighbourhood he is most associated with. His father Edevair was the person who made sure to get Romário’s career started, as an ex-player in Rio’s “5th team” America he had experience, the fact that he was the founder of his son’s first club Estrelinha perhaps also helped. As most players from Rio’s suburbs he played football on the street and on small concrete pitches, this laid the foundation for his great technique and cool in small areas. 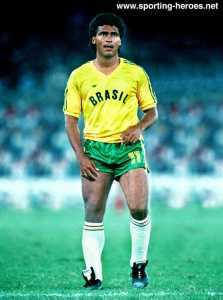 When he was thirteen he started to play for Olaria’s youth team, he also played for Vasco da Gama’s before making his debut in Senior professional football when he was 19; this was in 1985 for Vasco. From the first season he started producing goals, a habit he would keep up all through his career. At this time the most success he had in the prestigious local Rio cups, 1987 and 1988 the club were Carioca champions. In 1987 he gets called to the Brazilian national team, in 1988 he produced 6 goals in the Olympic tournament in Seoul making him the top goal scorer. His performance in the tournament made the Dutch side PSV Eindhoven purchase him the same year for at the time a very large sum. In 1989 he becomes South American champion with Brazil. He remained in PSV until 1993 during which time the team won the Dutch league thrice, he was leading league goalscorer in his first three seasons. His next club would be Barcelona, the first season with his new club he won the league as the top goal scorer. In 1994 he had a successful World Cup where Brazil won their first gold in 24 years, the same year he was elected By FIFA the best footballer in the world. His popularity back home was huge and in 1995 he forced his way back to Brazil and the Rio-club Flamengo. Romário played 5 years in Flamengo, although he had several controversies with coaches and that he for two spells was loaned to Valencia in Spain he managed to score 204 goals in 240 games. His biggest title with the club was Copa Mercosul. After a nightclub scandal he was fired from the club in 1999, much to the discontent of the Flamengo fans. His next club would be the rival club Vasco da Gama again, he remained there until 2002 and scored a whopping 136 goals in 140 games. The year 2000 was his most successful this spell, the team won Copa Mercosul and the Brazilian Championship. He was the league top goalscorer in 2001 and 2002. He left Vasco for another Rio team after controversies with the fans, he entered Fluminense and scored two goals in a victorious first game that secured the league title for his new club. In 2003 he was lent for a short spell to a team in Qatar but gets sent back to Rio labeled as unprofessional. In 2005 his contract with the club was not renovated, he goes back to Vasco again where he remained until 2006. During 2006 he played for teams in Australia and the US, in 2007 he returned to Vasco where he partly coached until 2009 when he ended his career playing one game for America; the club that his recently deceased father had closest to his heart. Romários career as a footballer was very much affected by conflicts with clubs, coaches, fans and other players. Some might argue Romários big mouth kept him out of the Brazilian national team for most of his career, after 1994 he never participated in a World Cup tournament again; his scoring record being a very decent 55 in 70 games many feel he had more to give. He has slighted powerful football greats like Zico and Pelé, something that for sure made his professional life more difficult. His womanizing and flamboyant lifestyle coupled with a tendency to be avoid team practices, are other factors that affected his performances. By many regarded as the best box goal scorer of all time, you got the ball to Romário close to the goal and you could count on a cool and exact execution, Johan Cruyff once called him a “penalty box genius”. Although he was involved in so many conflicts in his career, he is still deeply loved, the fact that he played for both Flamengo and Vasco (fierce rivals in Rio) and is highly regarded by both team’s fans, stand as testament to that. His personal life may have upset coaches but many people saw beyond that. For journalists Romário was a goldmine, every time he gave an interview; he would say something funny and challenging. That he is a popular politician today, is partly because he is says what is on his mind, that he was the star in the team that won the gold in 1994 is of course also important. As every good Brazilian footballer Romário has a few nicknames. The most famous are “Baixinho” which translates to the short one, and “O Rei do Gol” which means the King of the Goal.